Here we go then. In the quest for complete honesty and full disclosure, here is a painting from art school. I was 21 when I painted it back in 1985. This was part of my honours show at Duncan of Jordanstone College of Art in Dundee. It was probably my most successful work from that year, and the college kept it for their collection. It was unaccountably chosen to hang in a corridor in Ninewells hospital. I have more recent works hanging in surgeries and hospitals where the landscape elements and colours offer some degree of healing and comfort… but this painting? Anyway, I had time to read a lot back then and many of my paintings were inspired by writers like Orwell, Nabokov and Kafka. What can I say? I was young, and don’t forget the previous year had been 1984 so there was zeitgeist too. 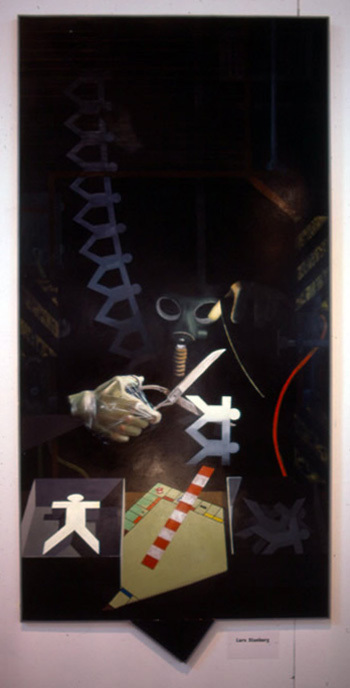 I had assembled the beginnings of a visual vocabulary and many of the elements here – the paper figures, disembodied hands, rulers, Monopoly, gas mask, warning graphics and so on – were stock in trade in most of my work, as was the shaped panel and the Caravaggesque chiaroscuro. How did I get here from there? There wasn’t really a neat gentle transition, just a jaded post-art-school hiatus in which I got older and became more interested in sharing sensory experience than illustrating ideas. See the First Painting post for the other side of the hiatus. The photo quality is pretty bad as it’s a low resolution scan of a slide taken in poor light, but you get the idea.